Fabricating & Metalworking magazine (http://bit.ly/2aIRd1H) reported that the lean goal is to move toward a forklift-free operation wherever it is practical. A fork truck free system typically requires less than half of the equipment and labor because one tugger can tow from four to eight loaded carts with only one operator while a traditional system needs four employees to operate four forklifts. Machine shops still using lift trucks to load jobs for machine tool stations are changing rapidly to achieve a fork truck free materials handling on the shop floor, or at least as much that is practically possible. In a lean shop, delivering full loads or pallets out to the production floor with forklifts does not always function as effectively at stations or cells designed to work with smaller lots of material. Fork truck free systems compliment lean manufacturing by replenishing material as it is used, rather than keeping excess material on the shop floor. Fork truck free systems open a brave new world of ways to tug loads in and around the plant on carts and dollies, loading and unloading work stations, and refilling storage queues as needed, all without forklifts. Carts and dollies can be used as visual triggers to deliver smaller loads of parts up to the floor only when they are needed for replenishment. Using carts and dollies help to remove the excess inventory that is stacked in the aisles by converting as much of it as possible into mobile queues that can be fluidly transferred throughout the plant as frequently as needed by point-of-use demand. Since most job shops and contract manufacturers now compete for smaller product quantities, using carts and dollies to convert the inventories they carry into smaller mobile queues can help them cut overhead costs and reduce their investment in work-in-process materials. The publication acknowledges that the choice to go forklift-free is not easy and requires much preparation. As the leader in Fork Truck Free, Topper Industrial makes the transition much easier. Topper provides lean material handling solutions to the supply chain. 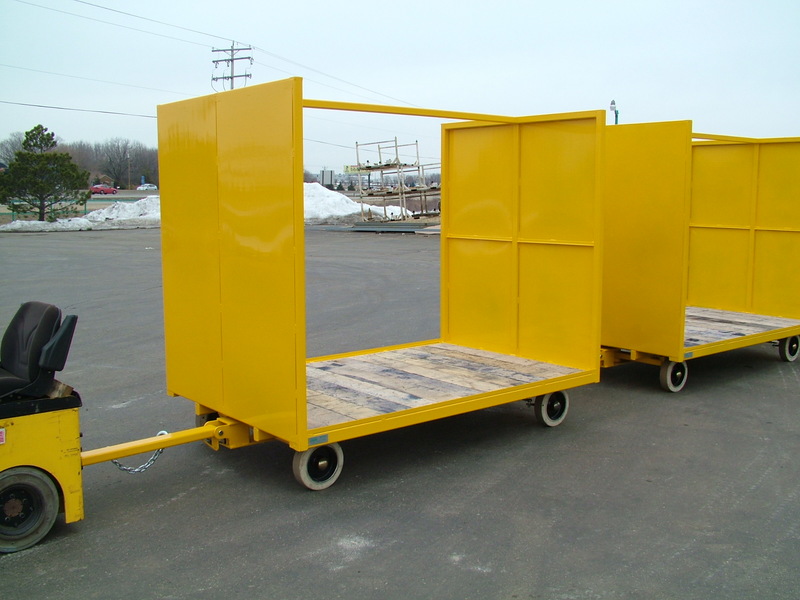 Topper is able to engineer and design Industrial Carts (Mother / Daughter Cart Systems, Quad Steer Carts or Tracking Carts, Specialized Delivery Carts, Transfer Carts with Roller Deck, Static Carts, Rotation Carts, Tilt Carts or Kitting Carts), Industrial Cart Components (Parts Department), Industrial Containers (Corrugated and Wire Mesh Containers), Pallets, Conveyor Systems (Gravity or Non-Powered Conveyors and Powered Conveyors), Lift/Tilt Systems, and Racking. All Topper Solutions are designed to work with new and existing equipment to help with the work flow throughout a plant operation creating more value added activity.